So, for no apparent reason, lately I’ve been dreaming of the impossibility of affording a Colnago bike for my next upgrade. There’s something to them, by every single account I’ve read online, and the top-line ones are still handmade in Italy under the watchful eye of Ernesto Colnago himself. Today, I innocently walked into my local bike shop (Cycles Passieu, the best bike shop for miles) to get a little revision done and was gently directed by Sakari (a Finnish guy working in the back – it’s a long story that hopefully will come out on this blog one day) to the far wall…and this. Or the frameset at least. It’s a 2009 EPS, and probably just my size. And the price is reasonable. Someone tell me it’s not worth it! No worries about that. I’m not thinking about electronic shifting, just the frame. I hope you’re a patient man, Steve! I am. My chief concern is they will have a requirement for all purchasers to shave their legs. That will be a major dilemma for me. Don’t do electronic shifting, when it goes bad, it goes bad. Not what a long distance, out on the wide-open roads kind of rider wants. Colnagos have such a cool history. Plus the little details on the bike are just so fun to own. They also ride very well. But how about a Cannondale – I love the ride of a Cannondale! I’m not looking at electronic shifting. I’ve had a Cannondale and I like it just fine, but I want a European bike while I’m in Europe. Preferably one made here, too. I just like the idea of it. You’re not helping, Stephen…or are you? How’s your search going, btw? Never tried electronic shifting so can’t comment on that aspect. As for the frame . . . a year ago I bought a black on black C59. Which was (cue swelling music) THE BEST PURCHASE DECISION I EVER MADE–EVER, EVER, EVER. Just sayin’. As it happens, she and I will be in Geneva next week for the fun. Have enjoyed your blog very much, btw. See you there. Chris, I’ll look out for you on the road (that didn’t sound exactly right, did it?). Did you get the disk brake version? A client of our had one on a tour recently and he was raving about the ‘modulation’. Again, not thinking about electronic shifting (EPS refers to the frame name, not Campy’s transmission). I KNOW I can’t afford the C59, but just for laughs, could you tell us what’s so special? I’ve never owned (or ridden) or high-end frame before, so I’m totally intrigued. Mine is a 2012, which I bought at the end of the season as the ’13s were coming out, so without the disc brake (about which, aesthetically speaking, I’m ambivalent). Wish I were a cycling journalist charged with reviewing every new top frame on the market; then I’d have the experience to answer your question properly. I confess I’m just another MAMIL who fell in with a bike far better than he deserves. That said, I have ridden some pretty swell steel, aluminum and carbon frames over the years and the Colango is just better in EVERY category than any of them. IT’s wicked fast on the flats and uphill, AND its very, very comfortable. IT’s a super smooth ride. The smoothest of them all? I can’t say. The smoothest I’ve ever ridden, for its speed. I ride on Mavic Rsys SLRs, which I like a lot. Yeah, it’s a dream bike–but here’s the thing: 7000 miles later I feel as excited about it as the day I wheeled it out of the bike shop, maybe more so. How often can you say that? About any high-end purchase? Colnago is the dream bike you keep dreaming about. It’s beautiful. It’s exquisite. It’s very existance makes the world a better place. If you have the chance, go for it. Great review, Chris. I see a great future for you! Like you, I wish I could test everything on the market out. This is one of the issues of buying a frameset, for me. Can’t ride it. It’s a leap of faith. It sounds like with Colnago, though, it’s a leap worth taking. Thanks, and see you in Geneva. Bryan, I’ve been watching with interest. It’s a great-looking machine. I guess I just don’t want to stick with the same thing till I look around a bit. My switch to Campagnolo was the same thing, i.e. I wondered what all the ‘noise’ was about. There certainly seems to be a lot of ‘noise’ surrounding Colnago, too. And wait a minute…have you ridden the CV?! Gerry, I looked around and bought a Storck (in a moment of madness) and since then have regretted it. Now in the process of ordering a CV and selling the Storck. What is that old saying…..The grass is always………….LoL! Do we have to guess the price, or is it too personal a question ? 1800€, used, Roan. I doubt it’s ‘cheap’, but I’ll bet it’s ‘reasonable’. I appreciate the confirmation that I deserve something top end, too. I just wish there was a stronger relationship between ‘deserve’ and ‘afford’. How much is the bike. I was wanting one for HR but could not get one in time. Is it a C 59 they are the only ones made in Italy. You will love it. Stevo, it’s 1800€, used and a 2009 model. That’s just the frameset, too. It’s made in Italy and was the top model Colnago had back then. The C59 is lovely, but really not sure where I’d get the cash for one. Thanks, James. I just might. I wonder if they have a layaway plan…? I rode my mate’s CX1 over Xmas around Melbourne and mum’s place in the Macedon Ranges north of Melb. I always poo-poohed them, but, if my SWorks Roubaix ever kicks the bucket, it’d be a CX1 if I could get one cheap. Thanks, Tim. Great to know it’s not all about the hype. Don’t be so silly Gerry. To let this go……….. I was waiting for your comment, Steve. 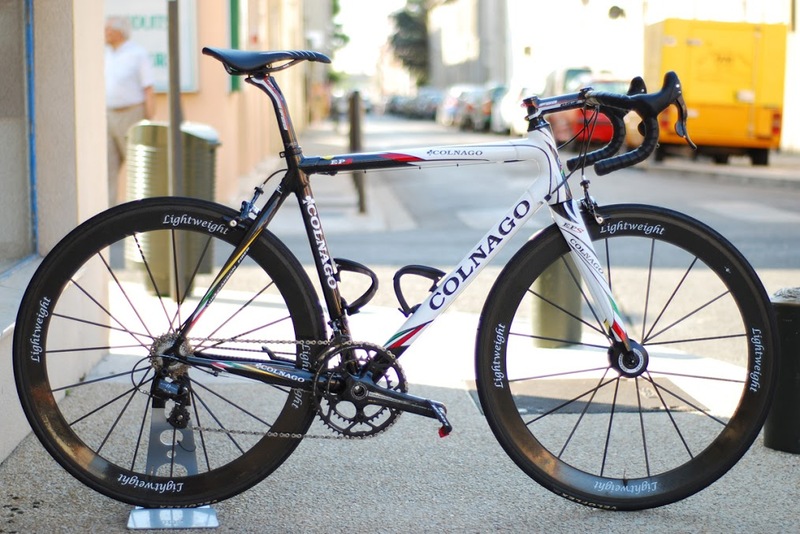 You own a Colnago, don’t you? Do you know the EPS? I am with Chris regarding “high end purchase.” Bought a little car 14 years ago (before kids)–the very few times I now drive, it still brings a huge grin on my face. You forget the money, but experience the joy. Very good point. I had a Honda Shadow way, way back in the day. Nobody asked me if it was a Harley, but I always tried to convince myself that it was! If this is about going local, then Time and Cyfac come to mind as far as your domestic offers are concerned. However, it’s about Colnago, isn’t it? Buy it. And, don’t put any Shimano parts on it because Shimano on a Colnago just looks so wrong. Cyfac! I had a crush on them for a bit a couple years ago. Rode one of their steel machines on Paris-Roubaix (well, most of it…) and loved it. But you’re right, it’s not about ‘local’, at least to that extent (although I do love that crazy Mondrian Look 586…). And don’t you worry, there’ll be no Shimano on whatever it is I end up buying! Hi, this blog post was a big reason why I bought my eps – same colour (amit) same year made but in trad geometry when I chanced upon a very good condition frameset in one of the bike shops near where I am located. I hoped you pulled the trigger in the end….would love to hear more about your eps experience….thanks in advance! I’m glad to hear I have an influence…and hope that you’re satisfied with it. I found out later that the frame was actually too big for me (before I learned about Colnago’s special sizing), so I gave up the idea. I did, however, buy a Colnago C59 (new) a few months ago and am building it up now. Really looking forward to feeling what all the fuss is about! Bonne route! Bit late in the day to add any comment but at the age of 70 and still pushing the odd mile or two I decided to tick one of my “must do”boxes before it was too late and bought the EPS with full Italian spec. Just love the way it responds to my diminishing energy levels and hopefully will serve me well for the next few years. If it’s an ambition to own a “top end” bike then just do it ….. There will be no regrets just a smaller bank balance but what the hell you can’t take your cash with you when you check out !!!!! Stuart. Great to hear you pulled the trigger on that EPS. I still see them from time to time at my shop and drool a little. In the end, though, I got a Colnago C59, so really broke the bank. Loving every pedal stroke, though. Enjoy the ride!